I just found this interesting article on Gotham Gal’s site mentioning Warren Buffett’s solution to end deficit in United States. I do concur what he said. I think that we just rely too much our faith on politicians who sit on Congress or Parliament to decide things on our lives, while we actually can do the opposite. 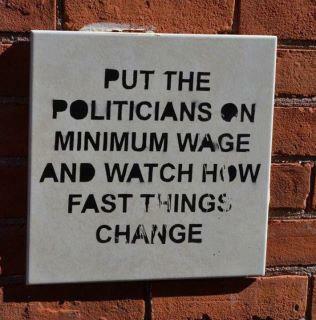 Politicians should be holding more responsibilities to whom they represent. Without us, they are nothing. So, I am suggesting you to read that article to get his words in full. We apparently could apply the same rules to manage Indonesia’s recent situation. By having or perhaps pushing politicians to care enough about other people should be sufficient to address many issues we currently have, such as poverty, corruption, low law enforcement, deforrestation, etc. Unfortunately it’s not as easy as being said. No doubt, we need huge efforts and commitment in all aspects to make it happen. Alright, just to sum up things, please see the following image. Do you agree?